Russia-backed militants shelled civilian inhabited localities twice yesterday. They fired 24 82-mm mortar rounds in Vodiane in Donetsk region, and damaged a household building in Avdiivka in the evening using grenade launchers, large machine guns and small arms. One Ukrainian soldier was killed in action, during one of the attacks in Avdiivka. Two more troops were wounded in a night attack in the vicinity of Maiorsk. The casualties were promptly taken to mobile military hospital, informed Ukrainian Ministry of Defense spokesman on ATO-related issues Colonel Andriy Lysenko at a press briefing at Ukraine Crisis Media Center. Militants conducted the largest number of attacks in Donetsk sector. Out of 11 attacks that happened in the last 24 hours, nine involved aimed fire. “ATO troops’ positions in the vicinity of Avdiivka came under ATO troops’ fire from various grenade launchers, large machine guns and small arms, and positions near Nevelske and Pisky were attacked twice. 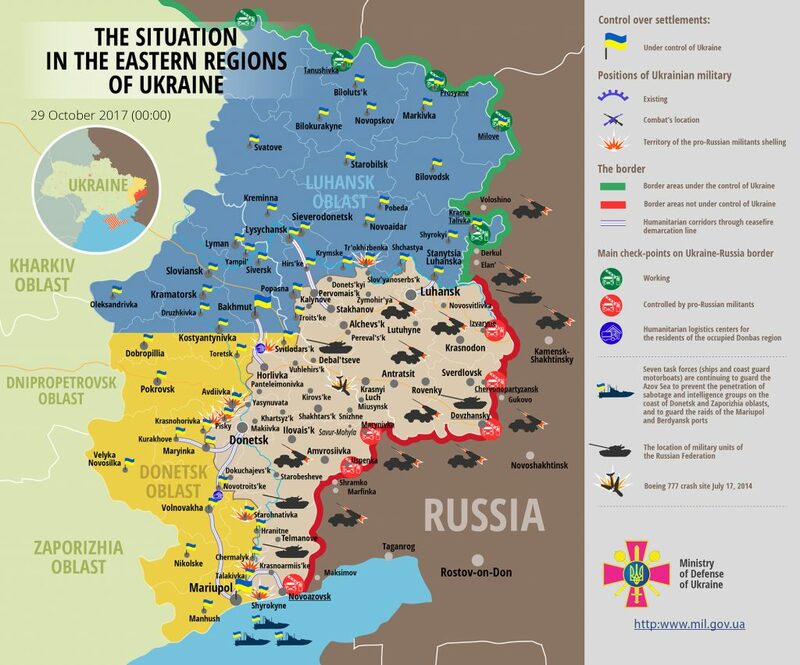 The enemy fired on Pisky positions from IFV weapons,” elaborated Col. Lysenko. Militants used grenade launchers, small arms and large machine guns against Ukrainian positions near Maiorsk, Opytne, Kamianka and Zaitseve. In Mariupol sector militants conducted four aimed attacks towards ATO troops’ positions using large machine guns and small arms. They attacked twice near Pavlopil and near Starohnativka and Shyrokyne. “Ukrainian troops used large machine guns and small arms, which made the enemy cease their fire each time,” said Col. Lysenko. In Luhansk sector militants used IFV to aim fire at ATO troops’ positions near Triokhizbenka. “Ukrainian troops did not return hostile provocative fire,” said the spokesman. In total, militants conducted 16 attacks against ATO troops’ positions along the entire contact line yesterday, aiming their fire 14 times. “Ukrainian troops returned adequate fire in most cases, using large machine guns and small arms,” added the spokesman. Report on the military developments as of October 28 is available here. Interactive data on the shelling: chronology shelling chart and the interactive map.